When you first start growing out your hair, it might be hard to imagine the end results. Growing long hair is a journey that takes time and commitment. To encourage you along the way, please enjoy these pictures that show how far you can "grow" in time. 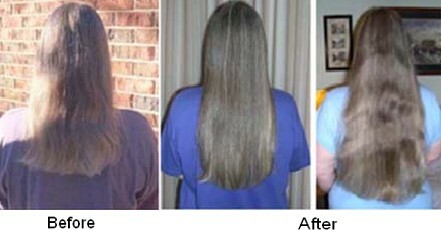 Progress is not only measured in length, but in hair health as well. The growing out process is not a competition, but rather seeking to become your personal best! Progress will happen, but it does take time! While you enjoy your personal growth journey, enjoy a glimpse of what might be in store for your future. 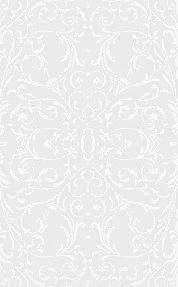 Want to submit your own progress pictures? Email me! Look at my fried hair in my "before" picture on the left. It was actually much worse looking than this picture even shows! 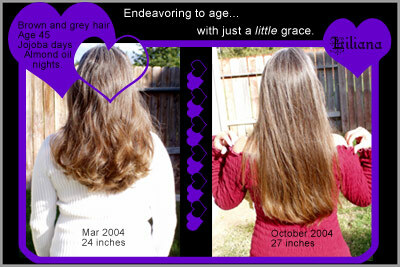 I'd been perming my hair for 22 years and had recently started putting on full color as well - to cover gray. Not only was I coloring on top of perming, I was washing and blow drying (with a diffuser) EVERY day! I used the same shampoo and conditioner all the time, and it was very harsh for my hair - even though it "claimed" be gentle. My hair had basically turned to straw. lot of length, but I was thrilled to keep SOME length during the whole process. My first product discovery was jojoba oil, which helped immediately, making my hair more pliable and moisturized. I've been using jojoba ever since. butter leave-in. I rarely wash the whole length anymore, doing the CWC method instead. I'm so happy I found the hair boards and thank everyone who has helped me along my journey to long, healthy hair. It's been a year since I found the Loom and altered my hair care routines. And can I tell the difference! Look between 2002-2003. There's virtually no growth, and I had one quarter inch trim that year. Now look between 2003-3004. I've trimmed over an inch off, not counting all the search and destroy missions, and it is still about four inches longer. I used to use a brush and a plastic wide-tooth comb, and now I just use my wooden wide-tooth comb. I comb very gently (yes, this is a change) and finger comb quite a bit. I used to oil very rarely, and now do so regularly. I am also much more consistent with my search and destroy missions (although I've been doing them since I was thirteen and sitting bored in the back of a car, whereupon I found that my Swiss Army Knife had little scissors on it...). I am much more careful with the type of shampoos I use, and I condition a LOT more heavily than I used to. Hmm...I'm much more careful during the shampoo process as well, not bunching it up but letting it hang straight and smooth in the shower. Small changes, but they certainly helped a lot. Thank you everyone who has knowingly or unknowingly helped me to grow better hair this year! My journey officially started the first time I quit smoking on October 25, 2002. 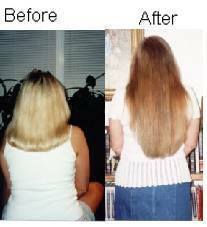 At that time it was almost tailbone length and extremely damaged from BSL down. 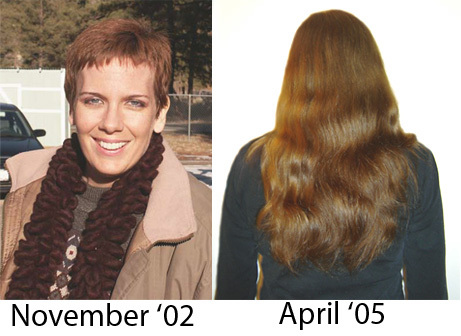 On November 15, 2002 I had it cut back to BSL (25.25" long) to get a nice healthy start. The first picture was taken a little over a month after the big cut and is the very first picture taken of my hair. 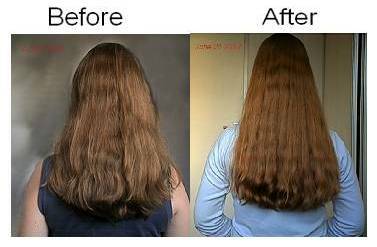 After I saw that picture, and the uneven hemline to my hair, I started looking into self trimming and found Feye's Self Trimming Method. I started trimming my own hair at that point and still haven't been to a salon since the cut. Now, here it is 2004, and my hair looks better than it ever has. I have continued the self trims since then with no plans of going back to the salon unless it is a GM salon. Now, here it is June 2004 and my hair is 30.5'' long and it is healthy, it has very little damage and is looking better than it ever has. My hair still damages easily but that's normal for my hair. 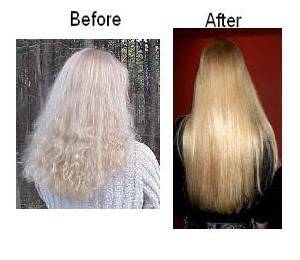 I am doing what I need to do to further decrease the damage and increase the overall look of my hair. I am still working towards the all one length blunt cut and that will take at least 2 to 3 more years to achieve. Overall, I am very pleased with the progress I have made with my hair over the last 1.5 years even though there is still a lot more work I need to do with it. I went from BSL to waist length in just one year. I can't wait to see what happens from here. 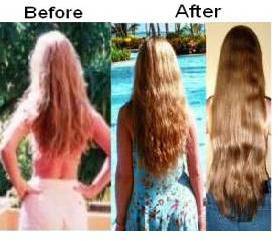 I first surfed into The Long Hair Loom while I was searching for a style to cut my hair. I'd lurked at long hair sites for years, simply because I like looking at long hair, but I never thought mine could look like that, or even get that long. At 50, I decided I was tired of looking like an old hippie when I had never been a young hippie. I found a method on TLHL to cut my hair myself, then kept on lurking. The advice was so good, the people so kind that I decided I had to turn the fate of my hair over to these nice and knowledgeable people. On lots of great advice, I decided to give my hair one last chance (to my husband's great relief!). I bought a decent shampoo (Creme of Nature) some of Sally's ION brand products and some plain old jojoba oil. I used the shampoo, then put on the jojoba and went to bed. I had my husband trim off the very scraggliest ends, he trimmed off 2 1/2 inches and there was barely any hair on the floor. I wasn't exactly expecting a miracle. But if you take a look at the picture above, that actually happened overnight. My dry, thirsty hair soaked up the joboba, I felt like a dusty old cactus that had suddenly bloomed! Evidently my hair liked the treatment! I had measured my hair before and after I had trimmed it, measured it again just for fun at the beginning of the month a week later and it had grown 1/2 an inch! 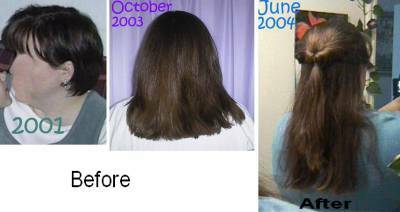 All this was so easy and inexpensive to do, and everyone here was so supportive, of me, not just my hair...I have had a major change inside my head even more than just my hair. I love my hair now, and I'm hoping it will someday get to waist length. I've got a long way to go, lots of layers to even out, but I know I'm going to have a great time while it's happening. I couldn't do without my friends here. My husband is thrilled and even my friends love it since I like to try out new styles on them first! Thank you everyone! My hair journey has been a long process of trimming off a lot of damaged hair! 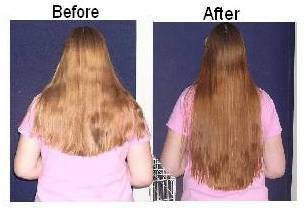 As you can see on my "before" picture, my hair was incredibly thin at the botton. 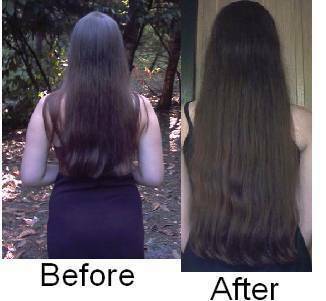 I had already cut off many inches when the damage began, but had not found the hair care boards to help me figure out how to make real progress. 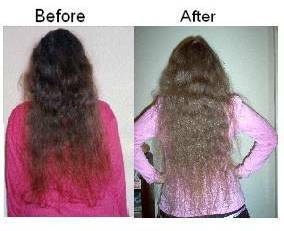 The result was that I continued to have damaged hair that was in real need of help. The "before" picture was the first picture I took of my hair when I found the boards. In time I learned things that helped me to progress. If I had gone ahead and trimmed off the thin ends, I might be farther ahead today with my length process, but I held on to them, trimming in small bits. 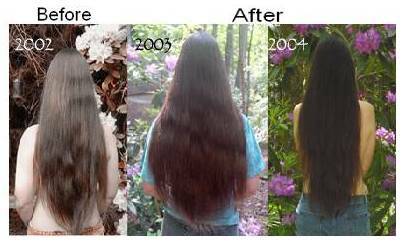 I have continued trimming this year (2004) to help get more of a blunt look to my ends, which has held me at the length of 34 inches. After my ends are more even, I will move my goal back to gaining more inches. My hair color change is due to the use of henna, which my hair seems to love. My best hair tips are: Do not use heated styling tools. Do not lather all of your hair. Only use conditioner on the length. Use oils on your ends, and handle your hair gently, always detangling from the tips to the roots. If your hair seems to be dry and damaged no matter what products you've tried, try natural products like Aubrey Organics. My hair doesn't like sulphates. 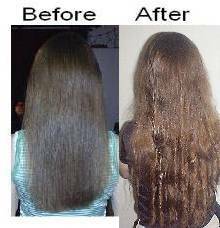 With the use of Aubrey and vinegar rinses, my hair was greatly helped. 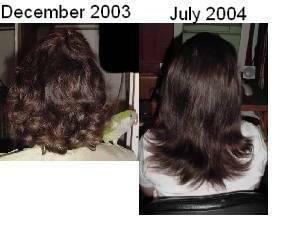 I amvery thankful to all of you who helped contribute to my hair progress over the years! Since I found the online hair world I have stopped using cones as they were drying my hair so badly. I discoverd satin pillowcases, plait my hair to sleep and wear a sleep bonnet (yes I am paranoid). I only comb my hair very gently, no more brushing. 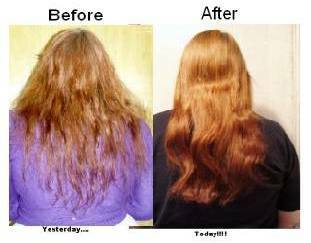 I take Biotin and MSM, and generally know more than I ever did about hair! Thank you all! 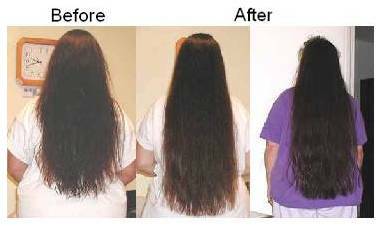 When I found the Loom in June 2003, I was not new to the online hair care world. I had found a site in January of that same year and that was when I decided to grow out my hair again. I’ve only had my hair short once, but when it was long, I never took care of it. I took my “stupid decision” (cutting it off) and changed it into something better – learning how to take care of my hair more than I ever had so it could grow long and beautiful. Before picture taken December 10th, 2003, after taken July 1, 2004.
during that period. I then grew from May 2001 to the March 2004 picture untrimmed and then had a self trim and am at 29.5" with a short term goal of 36" or waist. The old picture was taken when I just started to get into long hair care, in July, 2003, so they're exactly one year apart. I don't know what length it was, but it seems like past BS. My waist seems much higher in the picture than it really is. I'm now at 36" and practically at tailbone! This picture is quite old; it was after I gave up and cut my permed hair radically back. I think it was 2001 or so, since I permed first 1999, which went well, and then I had a second perm in 2000 which fried my hair to the point of breaking every 5cm (2 inches) at the slightest idea of stress. I gave it up as irreversible and too depressing and cut it to a length where it would live a little bit longer. May 2003. This sorry excuse for a picture was taken somewhen around 2 o'clock in the morning at a vampire life role playing session. The character actually stayed alife for 6 months, quite a record since "mortals" tend to be dead or vampirized in two sessions. 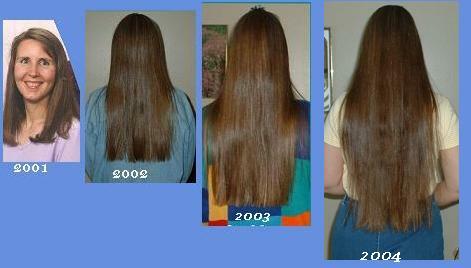 Hair: I had it cut back regularly (every three months) for as long as necessary and it became much healthier over time. But there is still a lot of perm left on the length. And I discovered the joys of Jojoba oil, helping against the still acute breakage under stress (running the fingers through the hair and pulling slightly). March 2004. This picture was taken by my sister. I wanted to know how my hair looked like before I went to have it cut. 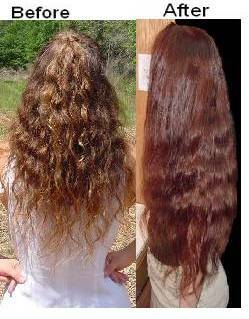 My tips felt very dry, and I had (and still have) this urge to get rid of the last of the perm permanently. This is about the time I decided that I would join the Loom. At the hair dresser's, we had a slight misunderstanding. The girl asked me if I wanted my cut round as before or straight. With all the talk about straight hair going on here, I wanted to give it a try and said: "round, but not as deep." What I got was a straight-line cut as in "put a ruler here and cut," and the hair parted not on the middle but a bit to the side. The difference is about 1cm and a great annoyance when I try to braid my hair, because I have to hide the ends, they are always slanted. Also, little ends stick every which way when I try to braid to my ends. Well, visiting a hairdresser is always surprise time for me... I don't see myself in the mirror when I have my glasses off. In the last picture you see my hair as it was three weeks ago. It is now nearly as long as it was in march, and a lot healthier. But I am still looking for a hairdresser to repair the mistakes the march excursion did to the good looks of my hair. I also changed my hair care routine since April, which now only consists of stuff I do eat: I use the honey-egg-shampoo once a week, and for the monthly conditioning party I whip up a non-tasty mayonaise with egg, honey, mustard (medium hot), some vinegar and lots of canola oil. Otherwise, I use Jojoba oil with a bit of Huile de Lavandine (the one ingredient I won't eat...) for hair and skin. hair growth amountedto three inches of growth in seven months. I had my seven year old sontake a photo for me right away and I compared it to my signature photoand WOW, my hair had really grown and it showed. I was hooked. It wasvery motivating. I've submitted the two photos to Fox to add here. My fondest childhood memories are of the times when I sat at my grandmother’s knee while my aunts unbraided, gently combed and then re-braided her long white hair. I don’t know why that made such an impression on me, but it did. At the time, I was about 5 years old and had waist-length blonde hair myself. Unfortunately, when I started to school, my mother decided it would be easier to take care of if my hair was shorter. So, she took me and had my hair cut into a pixie!! I guess I’ve been trying to get my long hair back ever since then, although now it’s more white than blonde. In February 2002, I finally decided I was going to make it happen. My mother kept telling me every time she saw me that I needed to get my hair cut. But, I persevered! Luckily, I found the hair care boards and learned quite a few things that I didn’t know about taking care of your hair. I’m still experimenting with different things like most everyone else – brush, don’t brush, wash, conditioner only, comb, don’t comb – but, I’ve settled into a routine that works pretty well for me. Every now and then I think about cutting my hair, then I think about it some more and decide that I really don’t want to after all. I’m not saying that I will never cut my hair short again, but I just can’t think of a good reason why I would. "I went to the barber in summer of 2002 and had him shave my hair with a #4 guide. My decision to do this was not only a way to start growing long, healthy hair, but also a metaphor for "getting rid of the past". I have no regrets about this decision. I just pretty much left it alone to do its own thing for the first two years. I refrained from coloring and using heat on it. I didn't even trim it or anything. Just washed and air dried. I can't say I didn't have my share of bad hair days during the growing out process! About a year ago, I noticed my hair thinning along the hairline and it lacked luster and "life" in general. I was very concerned about the hair loss. It could have happened from several reasons - stress, change in hormones, poor diet, did I mention stress? task, however, I am very thankful that I took the time and effort to do this because my hair started to fill in again and it looks and feels very good, in my opinion. bristle brush which I love very much! 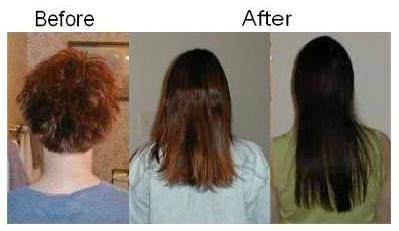 For anyone who is trying to grow long, shiny, healthy hair, good luck on your journey! To me, it has been not only a journey to grow long hair, but a journey of self-discovery.